Description: Annual herb, glabrous, glaucous. Leaves obovate to lyrate-pinnatifid, 5–20 cm long, to 8 cm wide, margins toothed to lobed. Scapes ascending, to 60 cm high; bracteoles fused into a cup, to 6 cm diam., margin toothed. Sepals 5, fused into a tube 4–6 mm long; upper one 9–11 mm long. Corolla 15–17 mm long, shortly spurred, yellow or brownish to white or pink, usually glabrous outside, bearded inside, with enations; wings much shorter than inferior lobes, usually < 1 mm wide. 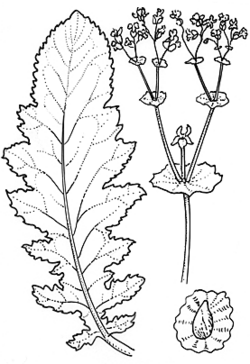 Indusium depressed-ovate, c. 4 mm wide; lips ± glabrous towards centre. Capsule compressed-ovoid, c. 8 mm diam., ± glabrous; seeds circular, 5–6 mm diam., punctate; wing to 2 mm wide. Distribution and occurrence: Grows in drier communities; widespread in arid and semi-arid regions, west from line between Bourke and Griffith area.